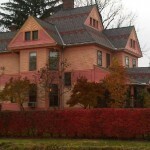 At this 19th-century Victorian home-turned-inn, people have witnessed unexplained voices and music, and the piano in the parlor plays songs by itself. The ghost of a stern-looking man is said to appear in Ceilan’s Room, and Anna’s Room is haunted by a servant girl’s spirit. The servant girl also has been seen at the top of the staircase. Hi, I just stayed here and will bookmark and submit a pic or two maybe. I remote viewed this location and told my daughter this was haunted. I did not know that it was considered haunted I hadn’t read anything about it. The dining room felt really creepy and I stayed in Aaron’s room. When I walked through the dining room at night to get to my room around 11pm, a spirit approached on my left side and whispered, “Kimberly ” in my left ear. I was not surprised and it is not unusual as I see between the dimensions. The second night I was lying in. bed and I began to see energy moving around the room. It felt creepy too. I even had to turn the large mirror to the wat a good idea to have tons of mirrors in haunted houses. s in haunted houses. I also was SCRATCHED and have a picture but it’s too intimate to pulbish publicly but can send to you.